One of my favorite blogs is Pioneer Woman - she's fun, funny, and her blog is full of pictures and step-by-step recipes captured on film. When I first made this pasta, I was amazed by how a few imgredients could create such amazing flavors. 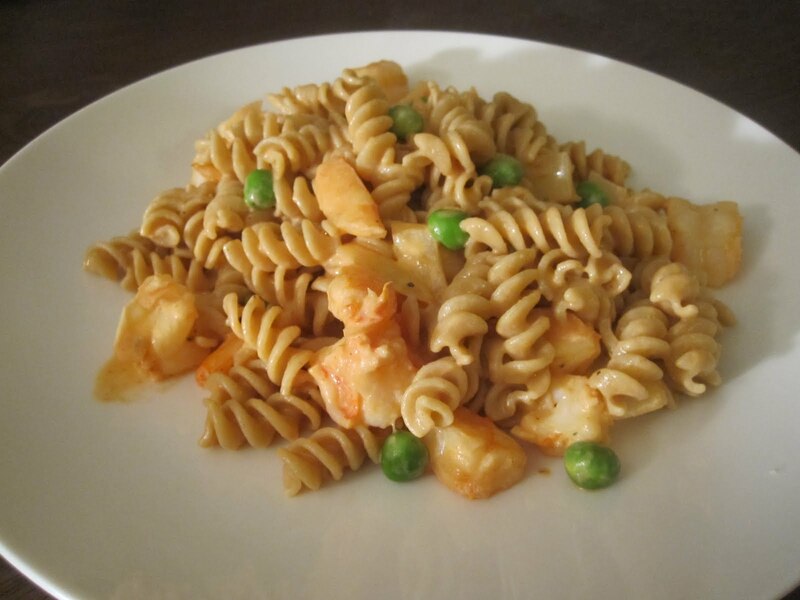 Simple and straight-forward, this pasta requires minimum prep work, especially if you buy pre-peeled shrimp. Or buy shell on, so you can take out some rage issues while peeling them, and then save the shells to make shrimp stock. A couple weeks ago at the Irvine Farmers Market (Saturdays 8am-12p) I came across some English peas. Super cute! I envisioned myself sitting on a porch in gingham and Ginger-esque pigtails, shucking peas. In reality, they were shucked over my kitchen sink while I was still in my work clothes, but the inital idea was very romantic. They look a lot like sugar snap peas so make sure you verify with the seller that they're English peas. You simply pop the pods open, run your finger along the inside and the peas fall out. 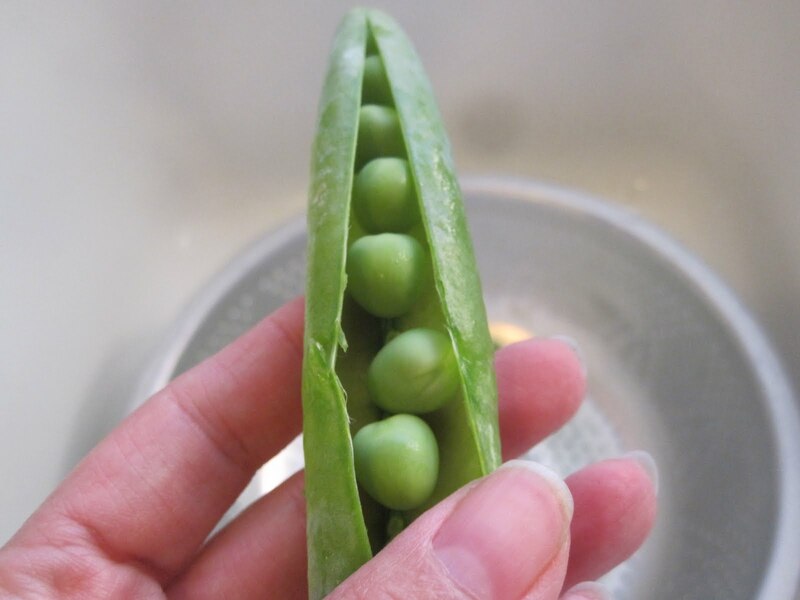 Try to get the smaller ones, as they are sweeter; the larger peas may be kind of starchy. These ones below were starchy (see how huge they are) but I got some a couple weeks before that and they were small, sweet and crisp. The peas really adds a brightness to the dish. 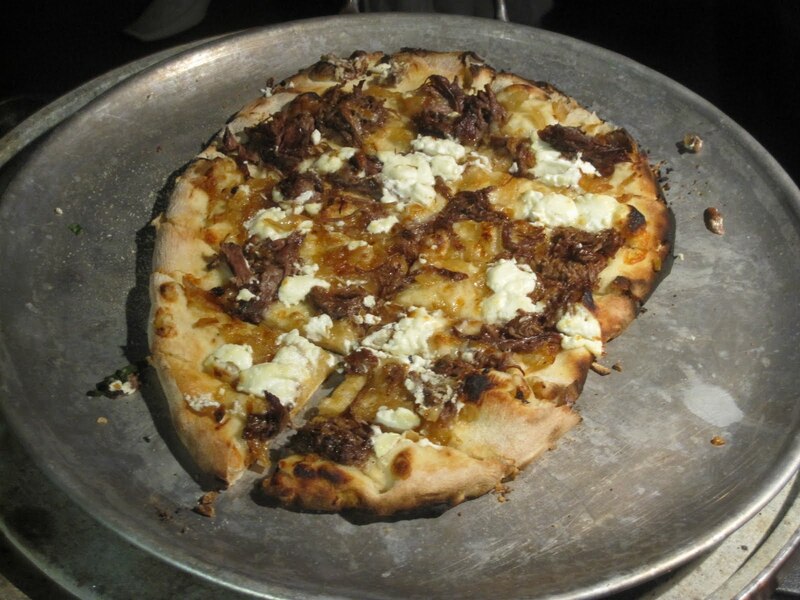 You can totally make this yourself tonight! Just go to the market and grab a few ingredients. Dinner will be on the table in no time. In a large pot, bring water to a rapid boil and add enough salt to make the water taste like the sea. Add pasta and cook to just al dente. You want it barely done, with still a bit of a bite, so it can continue to cook in the tomato cream sauce. In the last minute of cooking, throw the peas in and let them blanch before draining. In another large pan, melt oil and butter over medium-high heat. Cook shrimp on one side, and then the other, until pink but barely done. They will continue cooking in the sauce later, so do not overcook. Remove, cool slightly, and cut into 3-4 pieces per shrimp. In the same pan, add reminaing oil and cook onions for about 3 minutes until softened and translucent. Add garlic and stir for another minute, to toast the garlic. Add wine; it should sizzle and pick up all the shrimp bits and flavoring at the bottom of the pan. Let the alcohol cook off for a couple minutes. Pour in the tomato sauce and once heated through, lower the heat to medium-low and add the heavy cream. Stir to incorporate, the sauce should be lovely and pinkish. Add shrimp. Once the sauce is done, drain pasta and peas; add directly to the sauce. Stir to coat the pasta; it will finish cooking and soak up the sauce. Add basil and stir to incorporate. Salt and peper to taste. It is very important to add enough salt, as the dish will not taste right otherwise. Yesterday night was my first foodblogging event! *gasp* Yes, I've only barely started writing but the lovely Anne of Tuna Toast was the host of the event and kindly invited me. I feel like I know so much about so many bloggers, though I had never met them before. Is this what stalkers feel like? It was a fantastic event, and I was able to meet friendly, gracious people who were fully supportive of me and offered many kind words and encouragement to my new fooding-writing venture. The event was held at Wild Wood Ovens & BBQ's, which is a cozy intimate outdoor kitchen with patio. 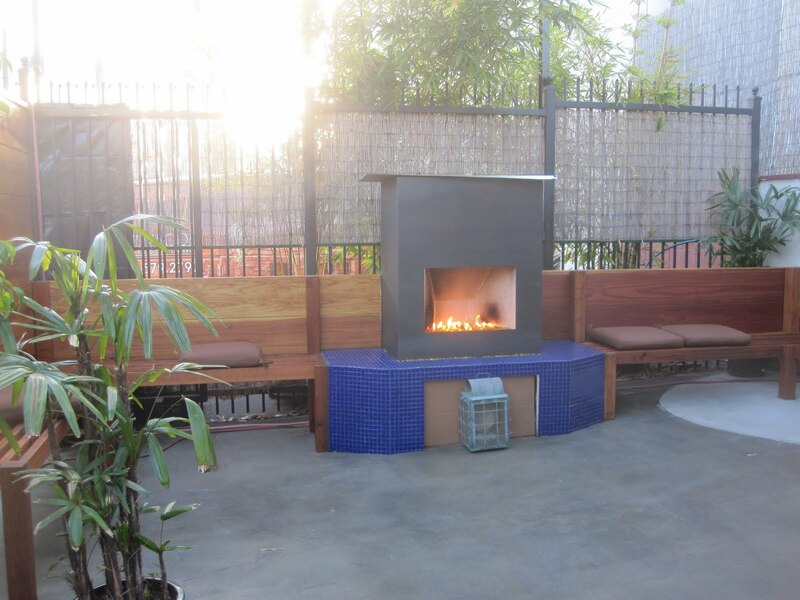 Located in Eagle Rock with plenty of street parking (important to those who have gone to events in Hollywood, Santa Monica, Venice, etc), the kitchen features two wood burning ovens for pizza and braising, and grills for churrasqueria. 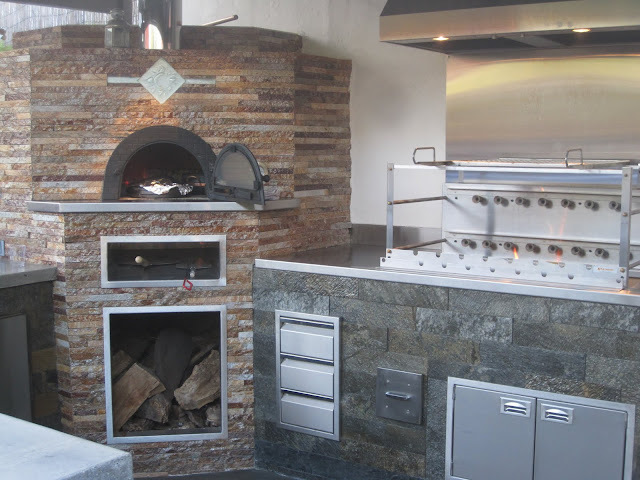 Outdoor wood burning oven. I need one of these when I get a backyard. Could we make smores here during parties?? 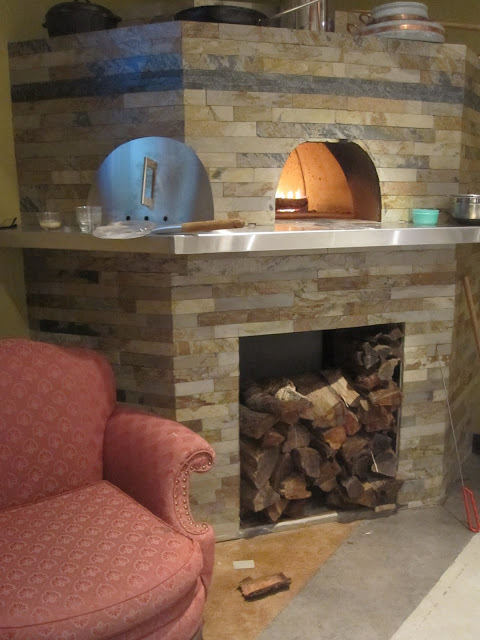 Indoor wood burning oven at the back of the house. Love the easy chair next to it - kick back and chillax while the pizza is getting delicious. Berkshire pork and lamb churrasqueria. Mmmmmm. 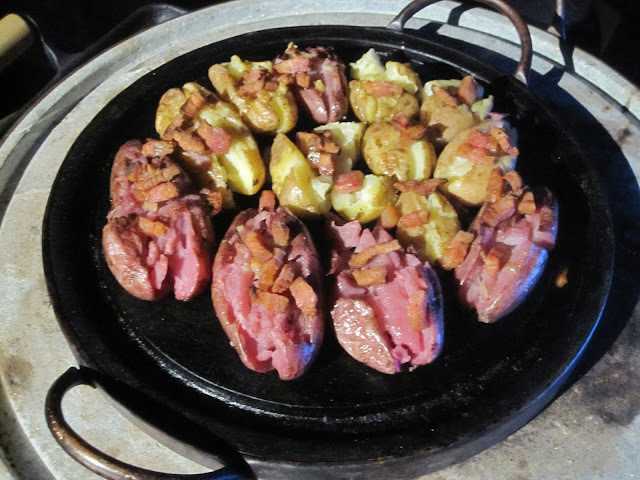 Fingerling and purple potatoes with bacon lardons. Braised Berkshire pork. So tender that it literally fell apart when people stuck their forks into it. Shortrib and carmelized onion pizza with goat cheese. Boyfriend's favorite of the night. Everyone was so great to talk to that we stayed longer than we originally intended with a 5am wake up time in the morning. 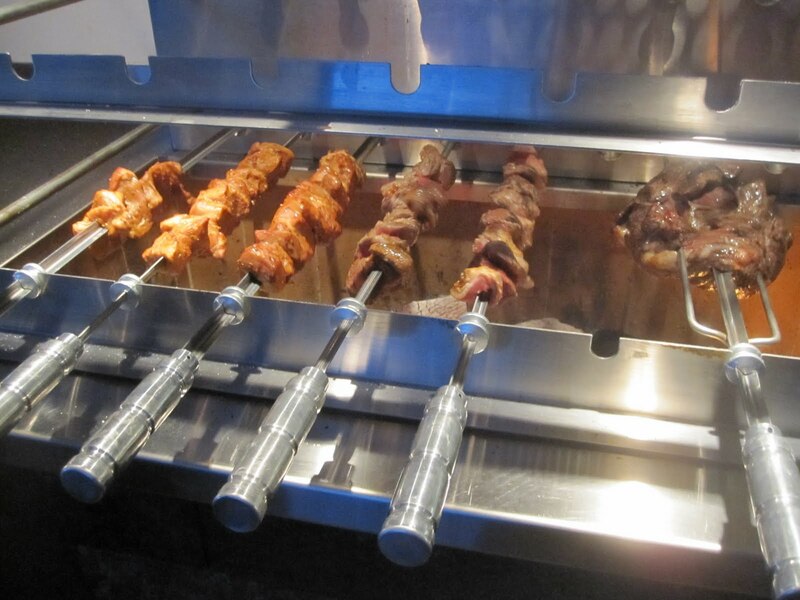 The place can be rented out for either a pizza party or a churrasqueria/meat party, with alcohol provided by the owners or BYOB. 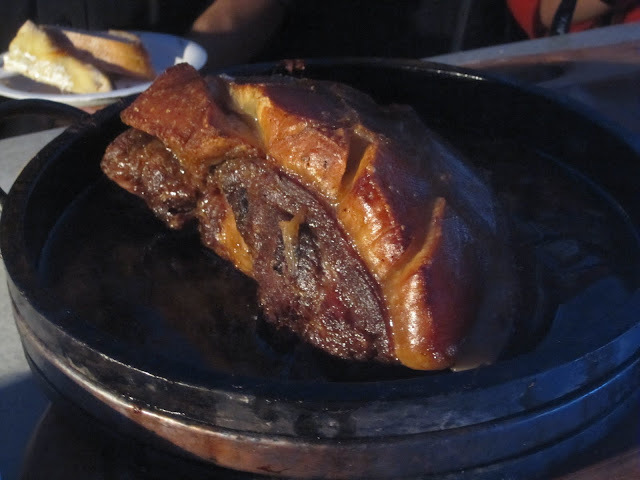 Also, owner/proprietor Michael Gerard holds cooking classes for wood-fired cooking or learning how to use a churrasqueria. They will also sell you their ovens, in all sorts of fancy forms and in a variety of sizes; you'll be wood burning your own pizza at home in no time. Next birthday party here?? We have a lot of summer babies coming up! Now that I'm going to the gym for the first time in my entire life, I've started thinking more about what I eat. Not because I'm becoming one of those crazy health-conscious fanatics, but because I've been going for about two months and haven't noticed any "changes." Basically, I don't look like Giesle yet, and that's just unacceptable cause I've put in a lot of hard work! Then my friend Jennifer tactfully (or bluntly) pointed out that in addition to increasing my activity/exercise, I've also increased my cake/pastry consumption. Hmm, this may be harder than originally planned. 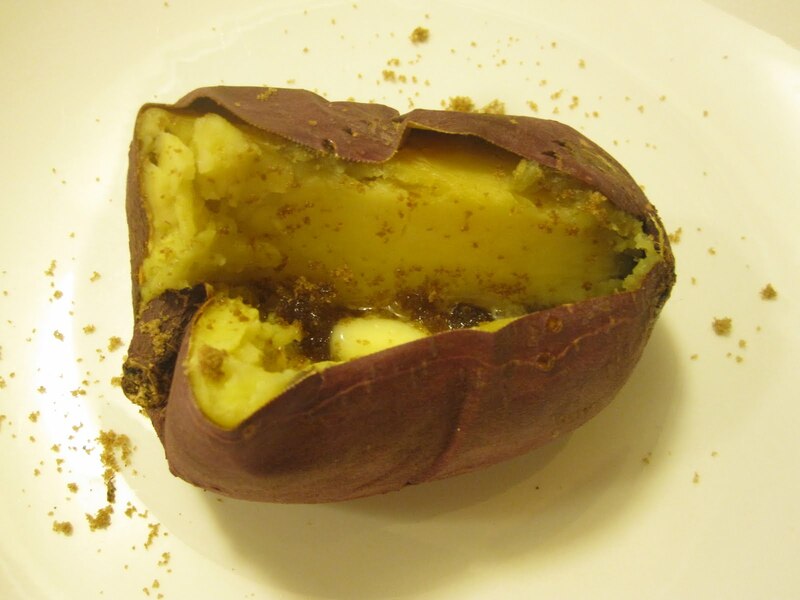 However, in browing my weekly magazines, I came across a quick solution: the sweet potato diet! Through some basic research, I now know there is absolutely no merit to the "eat nothing but sweet potatoes for three days - it'll tighten everything up and you will look fab!" but every bit helps, right? Plus, sweet potatoes are packed with nutrients and fiber and at least it's not the baby food diet. So I went to the market and bought three different types of sweet potatoes, so there is variety. So far I've eaten one each for dinner and breakfast, then caved and had hot wings with fries during the Lakers playoff game. Should you be inclined to experiment with me for this "diet", baking is the best way to get the full benefits. Boiling is good too, but then you don't get the fiberous skin; deep frying is definitely not an option at this time. Currently I'm eating them plain, since they are sweet by nature (about halfway though it gets slightly cloying), but feel free to add a pat of butter, brown sugar, maple syrup, salt, cinnamon - whatever you fancy. Preheat oven to 400F. Line a baking sheet with aluminum foil. Lightly scrub the potatoes and prick all over with a fork. Place onto baking sheet with sufficient room in between them and bake for 75 minutes. 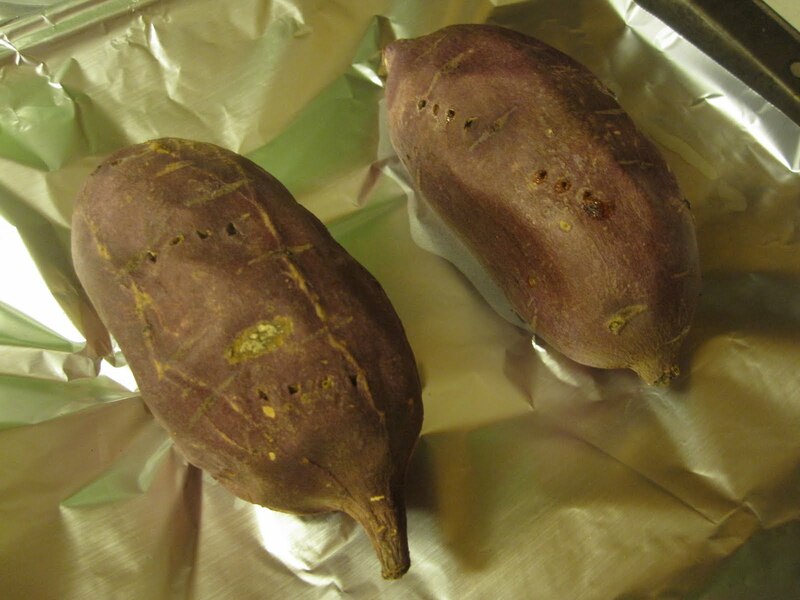 The sweet potatoes will be soft on the inside and the skin will be crunchy with delicious caramelization. Split open immediately and fill it with bad-for-you goodies, or eat plain hot or cold. Scallops are low in fat and calories, high in protein and uhh cholesterol, but who really cares when they taste so delicious (just eat them in moderation ie not a few dozen at a time). To get a good sear on scallops, make sure they are dry dry dry. I generally set them out wedged between two sheets of paper towels to blot excess moisture. This is a bit harder if the scallops are bought frozen, but you can leave them between several sheets of paper towels in the fridge overnight to get the moisture out. Fresh & Easy offers never-been-frozen scallops in a pack of 9. In a large pot, bring water to a rapid boil and add enough salt to make the water taste like the sea. Add pasta (the one in the picture is mafalda pasta) and cook to just al dente. You want it barely done, with still a bit of a bite, so it can continue to cook in the tomato cream sauce. In another large pan, melt oil and butter over medium-high heat. Cook onions for about 3 minutes until softened and translucent. Add garlic and stir for another minute, to toast the garlic and bring out the aroma. Add wine and let the alcohol cook off for a couple minutes. Pour in the tomato sauce and once heated through, lower the heat to medium-low and add the heavy cream. Stir to incorporate, the sauce should be lovely and pinkish. Salt and peper to taste. Once the tomato sauce is done, drain pasta and add directly to the sauce. Stir to coat the pasta; it will finish cooking and soak up the sauce. 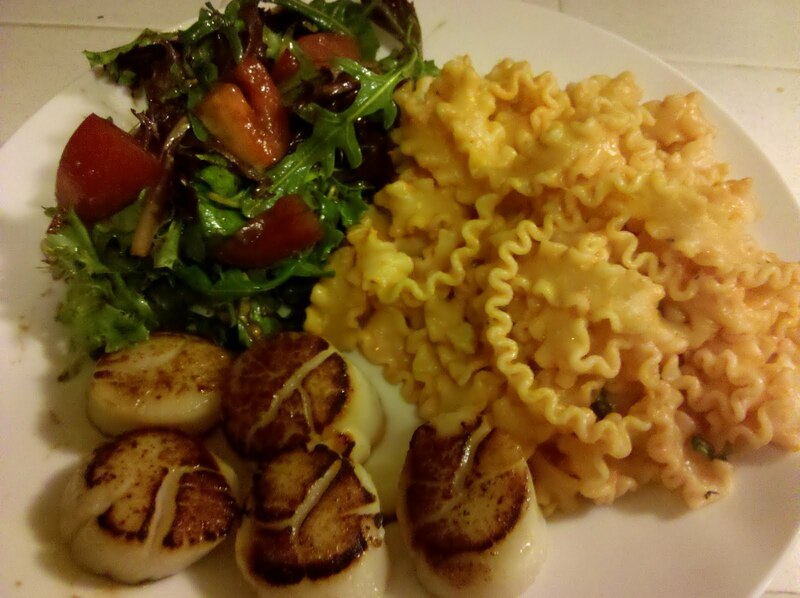 Bring the scallops to room temperature by leaving them out for about 15 minutes. This helps the entire scallop be the same temperature throughout, which helps them cook through quickly without having any raw cold spots in the middle. Melt 1 tablespoon butter and 1 tablespoon oil over high heat. Once the pan is very, very hot, add scallops in a single layer. Make sure you don't overcrowd the pan, or they will steam instead of sear (do two batches if you have a lot of scallops). Don't move them! Resist all temptation to peek underneath and see the beautiful searing. After 1.5 minutes, turn the scallops to sear on the other side. If they have not gotten a good sear, leave them on the same side and check every 15 seconds until they are golden brown. Cook on the other side for 1.5 more minutes and plate immediately. Scallops cook up very quickly and continue to cook after you take them off the heat, so take care not to overcook. * Serve both with salad if you want to capture all food groups. * Substitute the wine/broth with vodka and you will have vodka sauce. For the last three and a half years, I've diligently followed and admired some very talented and creative members of the foodblogging world. Deep down inside, I hoped that my friends and family will be able to read my own food blog someday. Today is the day! Food is a huge part of every culture. The act of cooking and eating is the foundation for bridging several generations, bringing everyone together to the table for a moment in this busy, fast-paced world. The first recipe I ever post is a classic dish at many Chinese eateries, tomato egg. I remember my mom having me dice three tomatoes and beat six eggs so she could make this dish for dinner when I was in junior high. Strangely, it seemed to take forever to cut those tomatoes - was it because I had poor knife skills, or because everything seemed daunting at that age? She would also get mad if the tomatoes were not chopped evenly or small enough. This dish is great for a quick snack, or as part of a larger meal with several other dishes. Heat oil over medium heat and add tomatoes. Cook until soft with a pinch of each of salt and sugar. While the tomatoes cook, beat eggs with a large pinch of salt. 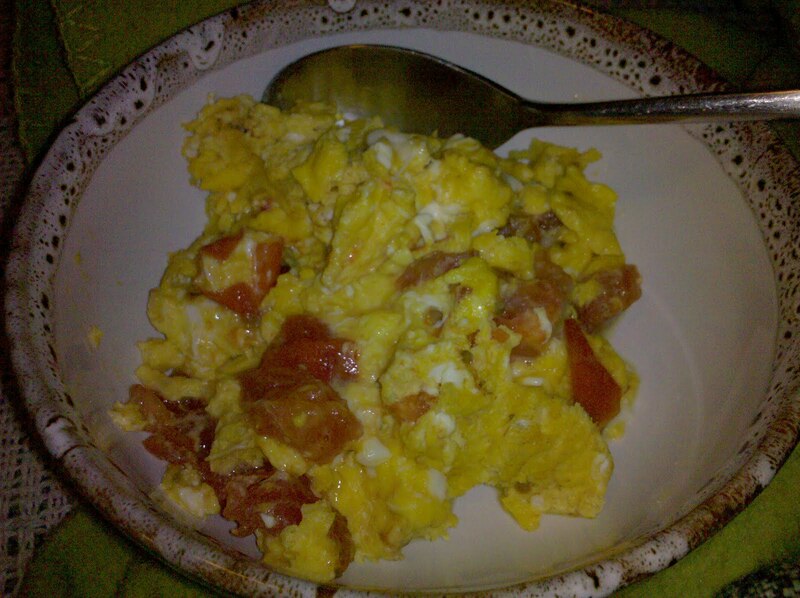 Once tomatoes soften, turn heat to high and pour in the eggs. Stir just until eggs are set, or to your desired consistency. The eggs will continue cooking once you take them off the heat, so be careful not to overcook. Dry eggs are rubbery and kind of gross. Eat immediately, with toast or with steamed rice. There are many variations for tomato egg, so feel free to add diced garlic, green onion, soy sauce, etc to enhance the flavor.